Do you know what percentage of my diet consists of tacos? Approximately 18.5%. Do you know what percentage of recipes on this little bloggity blog are taco recipes? Exactly 0.67%. And in case you wanted to check my math, that’s two out of 296 recipes. Pathetic. And shocking. I know. So let’s fix this massive oversight with recipe 297, bringing us up to a grand total of three taco recipes and a whopping 1.01%. We are well on our way to restoring order in the universe. Who knew tacos could be so powerful? Also, isn’t math SO MUCH fun? The base for these vegetarian tacos is a simple and comforting spiced lentil mixture, which I love eating plain just as much as I love stuffing it inside some corn tortillas. But I must admit that it’s this salsa recipe that really has me the most excited. A mixture of grilled tomatillos, grilled jalapeños and grilled pineapple, it’s got that whole savory-sweet thing going on that we all know and love. And since grilled food = good. And salsa = good. Then grilled salsa = mucho awesome. Makes sense, right? These Lentil Tacos with Grilled Pineapple-Tomatillo Salsa are perfect for those hot summer nights when it’s too hot to cook. 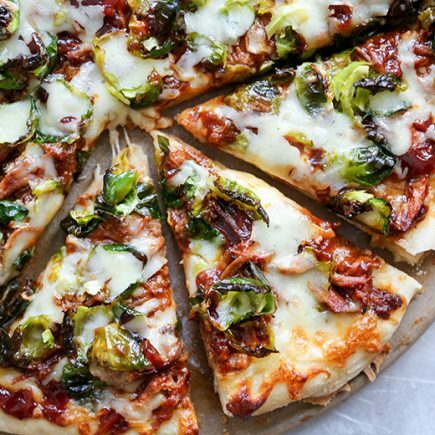 No oven required! If you haven’t had enough of my ramblings, make sure to listen to me talk about myself on The Dinner Special podcast! I’m totally not awkward at all (= sarcasm). You can find the audio link to my podcast episode here. And there may or my not also be some short YouTube videos floating around the internet as well. But I will neither confirm nor deny that fact. Make the lentils. Warm the olive oil in a medium saucepan over medium-high heat. Add the diced onions and sauté, stirring occasionally, until slightly softened, about 3-5 minutes. Stir in the minced garlic, tomato paste, salt and chili powder and cook for 1-2 additional minutes. Add the vegetable stock, lentils and bay leaf. Bring the mixture to a boil and then reduce the heat to maintain a simmer. Simmer uncovered, stirring occasionally, for about 25-30 minutes, or until the lentils are softened and the liquid is absorbed. Remove the saucepan from the heat. Discard the bay leaf. Cover to keep warm. While the lentils are cooking, make the salsa. Pre-heat your grill to high. Remove and discard the papery husks from the tomatillos. Rinse them well and then quarter them. Add the quartered tomatillos to a medium bowl along with the jalapeños. Drizzle some olive oil into the bowl and toss gently to lightly coat the tomatillos and the jalapeños. Also brush a small amount of the olive oil onto both sides of the pineapple slices. Add everything to your grill. I put everything directly onto the grill grates, but if you have one of those baskets for vegetables, you can use it for the tomatillos and jalapeños. Grill all of the ingredients, turning them occasionally, until darkened in places. Remove from the grill and place on a cutting board to cool until safe to handle. Then chop the tomatillos into chunks, finely dice the jalapeños and remove and discard the pineapple skin and cut the pineapple flesh into chunks. Add everything to a bowl along with the cilantro and salt. Stir gently to mix. Set aside. As the salsa sits, it will release some juices that will accumulate in the bowl. You can strain this out before serving. Assemble the tacos. Warm the tortillas so they are soft and pliable, either in your microwave, oven or on the stove top in a skillet. Fill the warm tortillas with some of the lentils. Then top with the salsa, a few slices of avocado and radish and a squeeze of fresh lime juice, if desired. Serve immediately. Any leftovers can be stored in an airtight container in your refrigerator for 2-3 days. Tacos (and chips and salsa) make up a good chunk of my diet too! I just can’t resist Mexican food, especially when margaritas are involved. These tacos look amazing, Liz! I love the lentils in here, so creative! And I think I could eat that salsa with a spoon! Yum! Thanks, Gayle. I could pretty much eat Mexican food all day, everyday! Umm those numbers are scary! I think we food bloggers have some work do to restoring order to this taco-less world! 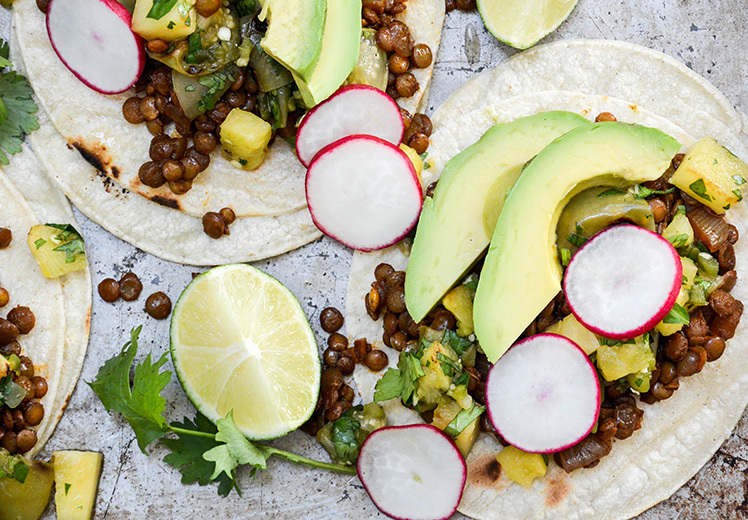 I think you’ve already got an awesome start, seeing as these lentil tacos are kiiiiiinda insane! Totally loving that pineapple salsa!! Right? I have some work to do to step up my taco recipe game! At 0.67%, you’re doing way better than me! I’m at 0% ! OMG! And HOW??? This needs to change – like now!! Tacos are the best, anytime, but since it’s been sooo hot out, tacos are even more attractive because there’s no hot oven involved! The lentils, yes, but the salsa… savory-sweet makes my mouth water, especially those tomatillos!! Delicious, Liz!! Zero? No way. We both need to up our taco game! Let me know if you try these babies out! Holy cow this looks beyond sensational! I have actually been thinking I need some more lentils in my life, and with that pineapple tomatillo salsa? BRILLIANT! Pinned! I have like no taco recipes on my site either, what is up with that?! These belong in my diet….. This salsa sounds a lot like one my hubby makes- and it’s a big favorite around here! I love how you lightened things up with lentils 😀 And I’ve gotta check out your podcast- how cool! Thanks, Allie! I hope you give it a listen! This is a perfect vegan meal, hearty, flavorful and so satisfying, I definitely have to make some tacos sooooon! You’ve hit the nail on the head, Katalina! I do eat a lot of tacos myself and I am always looking for ways to bump it up. These are just perfect for that especially with the lentils!! I’m on a lentil recipe desperate search these days. Glad I can help out with your lentil search! Let me know if you try them out! Bring on the tacos! I’m glad you decided to share a taco recipe with us today because I’ve been craving tacos so bad! The grilled pineapple and tomatillo sauce is calling my name. 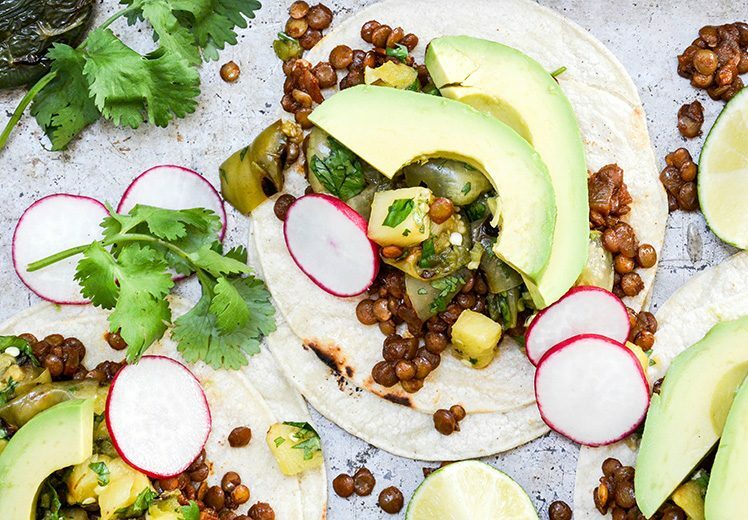 LOVE these lentil tacos, especially considering they’re dressed with grilled pineapple tomatillo salsa! Such a wonderful meal, Liz! I’m all about tacos. . and esp tacos that are different. . LOVE these lentil tacos!!! and that salsa looks amazing!! Liz, these tacos look so amazing! I do mostly desserts on my blog, but I’ve been thinking of doing some savory stuff just so I can post taco recipes 😉 The Grilled Pineapple-Tomatillo Sals sound fab! Oh I totally think you should do it. The world needs more taco recipes! Yay for tacos especially filled with lentils! And that pineapple tomatillo salsa? I could just eat that up by the spoonful! Love these! So glad I stumbled upon your blog this morning! This looks delicious! Glad you found me, Dani! Thanks! Ha ha you are such a scientist analyzing your blog taco content 😉 Love these, Liz, I’ve never had lentil tacos before…why? Always the scientist I guess! 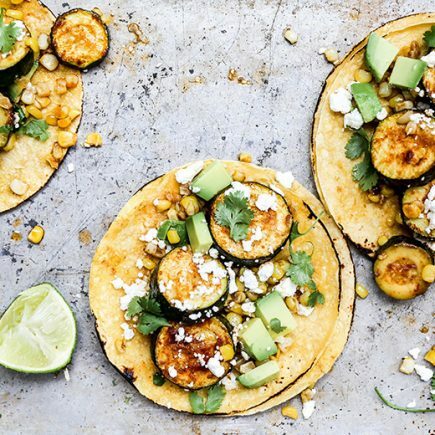 And you better fix your lentil-less taco situation STAT!